FOX - The Simpson's! Long Prosper - Plastic Metal Airplane Model. What a perfect gift for the Simpson's lover in the family! Plane markings feature Lisa, Maggie, Homer, Marge, and Bart Simpson. This awesome collectible is made in Germany by herpa. It shows The Simpsons characters on a bright yellow Boeing B737-300 Western Pacific Airplane.Herpa Wings' bestseller will now also become available in the 1/400 scale. 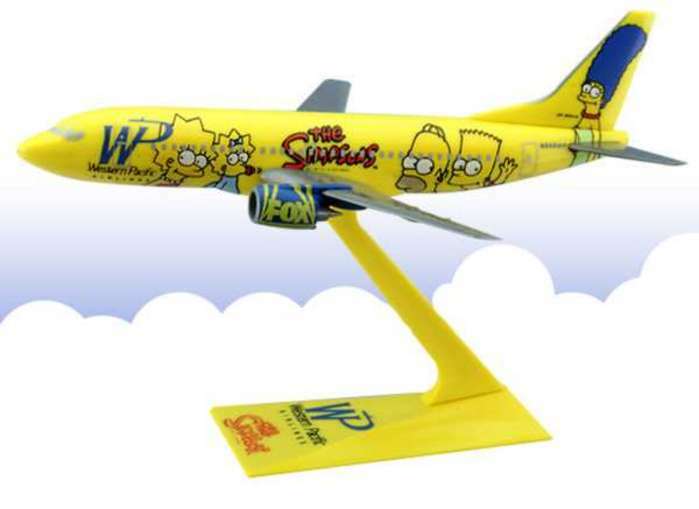 The 737 with the cartoon family ,The Simpsons" on the fuselage is not only popular among dyed-in-the-wool Wings collectors. This fact, however, did not save Western Pacific Airline. 1/200 Scale. Measures 8" in length with a 4 7/8" inch wingspan. Length: 8" W/S: 4 7/8"